Mother Nature's been pretty trippy lately, giving us summer weather and snow in the same week. It seems her mood has rubbed off on you today, and you're feeling a little outlandish. You can't exactly twirl your glow stick around the office, but you can bring out your inner club kid with electric-hued shoes like these cap toed sling backs from Lanvin (available at Barneys.com). 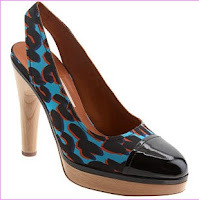 The turquoise and black leopard print with hints of red shows your wild side, yet the black patent cap toe gives them a professional air, and the sturdy wooden platform and 4.9 inch heel add an almost-bohemian flair. When you leave the office this evening, head to the nearest "underground" spot and ask the bartender for an Electric Lemonade (recipe & image courtesy of outofthefryingpan.com). With it's sweet-but-tart flavor and bright color, this drink says you're in the mood to party. You should be able to drink a few without hangover worries too. 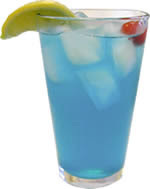 If you see a question mark on the bartender's face when you place your order, tell him or her to mix Absolut Citron Vodka, Blue Curacao, sweet & sour mix and lemon/lime soda. Mmm that drink looks delicious! But I agree with Tani Joy - I'm not feelin the shoes. Keep up the good work though - I love shoes & booze!